For many years, Zhu Weiqun has been one of China’s most iconic figures on religious and ethnic policies, facing up to personal representatives of the Dalai Lama and tackling foreign journalists' biased perceptions of China. He helped stabilize the situation in the Tibet Autonomous Region at the height of tensions in 2008 when some monks in Lhasa ran amok on the Dalai's separatist instigation, and visited the region five times that year at the request of the central government to enforce decisions and provide support as deputy head of the United Front Work Department of the Communist Party of China Central Committee. That is why even 11 years after the 3.14 incident, he was still warmly welcomed by officials and ordinary citizens of both Tibetan and Han ethnicities when he visited Lhasa this March. One of the civil servants, upon learning that Zhu was visiting, came over to him with Zhu's latest book, Persistence and Exploration of Ethnic and Religious Work, in the hope that he would get it signed. "My colleague entrusted me with this task. She is thrilled to have your autograph as she admires you very much," he told Zhu. With his written works and speeches being taken as important reference for work in both theory and practice in many of China's ethnic regions, it's no wonder Zhu gets such treatment. However, sitting next to Mr Zhu, it is difficult to imagine that this smiling, soft-spoken gentleman fought the hard battles of China's war of words against separatist and hostile forces of different kinds on the international arena. He represented the Chinese government in meetings with Dalai's personal representatives on 10 occasions between 2002 and 2010, focusing on possible arrangements for Dalai in China. Due to Dalai's lack of sincerity, the talks did not reach the expected results. But that mission allowed people both in and outside of China who care about Tibetan affairs to know about Zhu, an ethnic expert and a well-reasoned but firm defender of Chinese interests. When Zhu visited foreign countries over the years, he was interviewed by German, Swiss, Belgian and Italian journalists, among others, during which he answered many questions explaining Chinese policies, even though some of the questions were clearly biased. Many of the interviews have been included in his book. "I was part of the counter-separatist work and I dealt with the Dalai's representatives face-to-face in the war of words. I'm happy that I did not lose face for the government during such intense tasks," he said. Even after his retirement due to old age, Zhu has never stopped caring about Tibet's stability and development. 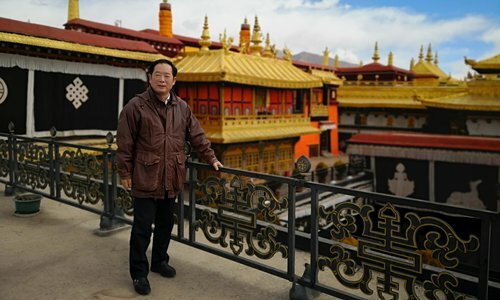 During the latest visit to Tibet, Zhu held talks with monks in major monasteries to solicit opinions on the country's policies and their actual life requirements. He also visited herder families who had been relocated from severe living conditions in altitudes of up to 5,000 meters in Nagqu to the Lhasa suburbs. The families were allocated free, new two-story homes with a spacious front yard by the government. Zhu said he is full of hope for the autonomous region when he sees those families living better lives with much more access to medical and education resources than when they were living in their former herding homes. He was invited to visit families' prayer rooms with enshrined Buddha paintings on the wall and plumbed washrooms. After retirement in 2018, Zhu continued to dedicate himself to the nation in fostering China's religious and ethnic policies. "How could life go on without doing anything?" he said. Zhu was frequently invited to give lectures at government departments and education facilities to officials and researchers. He barely rested after the grueling Tibet visit before giving a lecture to officials from around China at the Party School of the Communist Party of China Central Committee. He likes his lectures to be informative and targeted at specific issues, but admits that sometimes he prepares too much content for his lectures and has to cut them short due to insufficient time. He said he hopes the lectures will help officials better understand the Party's ethnic and religious policies, and improve their ability to distinguish and understand the ideas and theories in their real work. "Preparing for the lectures helps enhance my understanding and accumulate experience too," he told the Global Times. After retirement, Zhu has continued to read, learn and exercise, like many other old comrades. But most importantly, he continues to care about thinking and theories, and sometimes feels the need to participate in debates of principle. Indeed, over the past years, Mr Zhu has been at the center of a number of high-profile public debates. He advocated that Communist Party of China members should not believe in any religion, efforts should be made to promote Marxist atheism, and that the government's ethnic work should promote inter-ethnic contact, exchange and integration rather than overstressing the uniqueness of each ethnicity. One good thing about these debates is that they help him keep his mind active and close to society, Zhu said.